For cleaning, paring, peeling and slicing small fruits and vegetables. 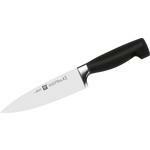 The paring knife is a very efficient extension of thumb and finger thus giving good leverage. Blade dimensions: 80mm/3". Made in Solingen, Germany. I call this my garlic knife since I virtually use it exclusively to cut garlic. Bought this on sale after an embarrassing incident about 5 years ago. I used the tip to clean a pizza pan clumped with bread crumbs in the breather holes. The tip broke off. Won't be making that mistake again.It feels very comfortable in the hand. Heckles makes top notch kitchen cutlery. You cannot go wrong. 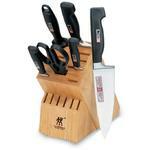 Hey, I wanted to share "Zwilling J.A. 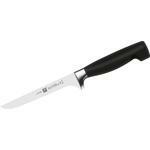 Henckels TWIN Four Star 3 inch Paring Knife" with you from KnifeCenter.